If a Singaporean eats out Everyday for A Year, He could spend $17,000. Zhun Bo! Shopback conducted a poll on Singaporean’s spending habits over the past 3 months (Oct 8) and concluded that Singaporeans spent the most on food and beverages. Singaporean’s spent more on food then children’s tuition, their vehicle and their home? The survey polled 700 Singaporeans, different age groups, different monthly income brackets. The poll was made up of 65% female to 35% male. 27% earned less than $3000/mth. 38% earned $4000 – $5000/mth. 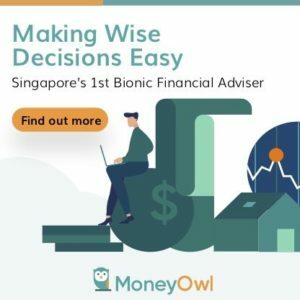 35% earned more than $5,000/mth. Or is it that Shopback’s sample is not representative of all Singaporeans? 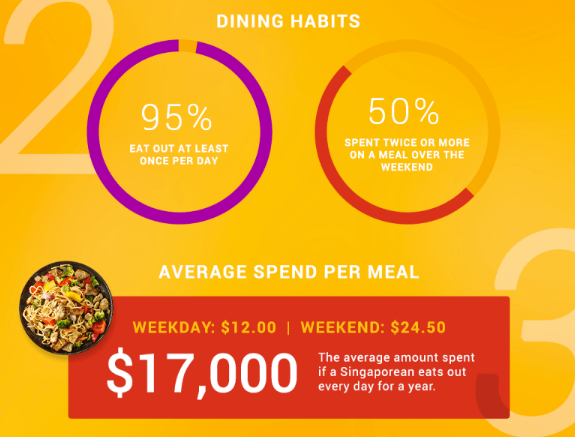 A Singaporean could spend an average of $17,000 if he eats out every day for a year. $17,000/yr, to me is a bit crazy. That is like $15.70 per meal! Now, I wonder if the Yahoo writer is trying to click bait, or is Shopback trying to click bait there. Those earning less than $3000 would take home $2400/mth. If they spend so much on food they would have spent 58% of their disposable income on food. If they earned an average of $4500/mth, they would take home $3,600/mth. They would have spent 39% of their disposable income on food. If they earned $7,500/mth they would bring home $6,300 and spend 22% of their disposable income on food. I honestly think that the average Singaporean do not spend so much on food. If you are low income, I can believe that a large % of your income goes to food. However, unless you are a foodie, spending $15.70 per meal is crazy. If I ask 10 of my peers, I doubt they average this much for food. I asked some of my friends making above middle income if they spend so much on food and they told me this is a ridiculous amount. Just to be sure, I checked with the family of 4 at Minimalist in the City to see if 2 working adults can usually eat up to $1400/mth and turned out they barely breached $600/mth with recent numbers down perhaps due to Kate’s sabbatical. It is only possible, if this is how a person making $10,000/mth eats. I have no issue with that by the way. I have friends consistently spending $1000/mth on food alone but that is also because they put so much away in building wealth and this is their main indulgence. Or is it that there are some blatant manufacturing spend happening. If your folks spend $17,000 on food dining out, don’t make it seem like all of us dine in such an ATAS manner. If that is not your intention, you certainly captivated us with that number that we ignored the rest of the survey results. A lot of us try to minimize our expenditure on food. A lot try to spend around $5.00 on each meal. And that would work to $450/mth. If you eat out and it requires $17,000/yr then a lot of people will be cursing at the incumbent government over this. Shopback probably anchored to people that their peers spent $17,000/yr on food. And since your friends spend that much on food, by spending 50% less, it is still an acceptable thing! If you shop through Shopback, you will earn differing % of cash back based on how much you spend. Since it is pretty convenient to just click through the Shopback app to do this, there is no harm doing this. If you use Shopback, you are identified as a savvy spender. However, if you also placed a high priority on spending less AND building wealth, you better not focus so much on the trees and missed the forest. Instead of spending $1400/mth on food but just limit to $450/mth, you gain $950/mth. If we channel this $950/mth over 10 years at a rate of return of 4%, you would have accumulated $137,000. You can eat, just don’t complain to someone why you don’t seem to have money with you after 10 years. sure…….sure……..an average Sinkee can afford to spend 17K on eating out………. It’s just a marketing gimmick (that’s their main JD afterall). i not sure of the amount but my family of 2 then 3 very , very seldom cook throughout our life but we are still O. K.
But i am sorry to say hawkers got tough life but they can charge what ever price they can demand if there is demand due to many people like my family. My family got 4 people and I seldom cook, maybe only cook lunch or dinner on Sat or Sun, both of my kids are in primary school. This is what our whole family spent on food from Jan to Nov this year. Hi Jasmine! Thanks for the information thats like 400 per person. Pretty much lose to my data!